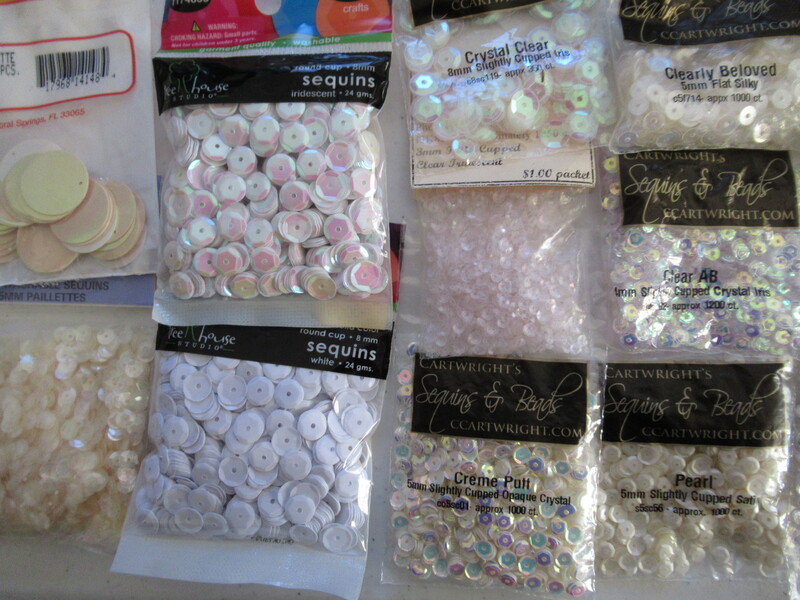 WARNING, lots of sequin pictures in this post !!! 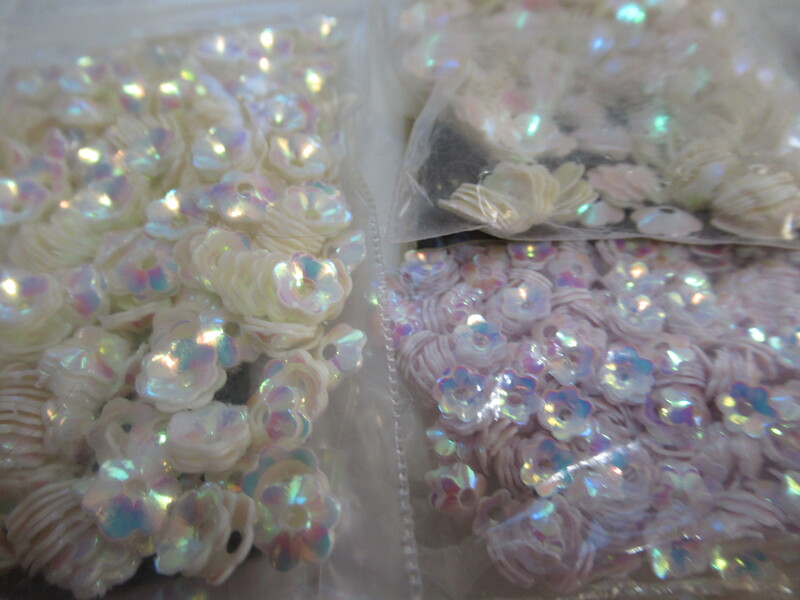 I thought since I have such a big collection of sequins,I absolutely love sequins. I would share some of the interesting sizes and shapes that I have. 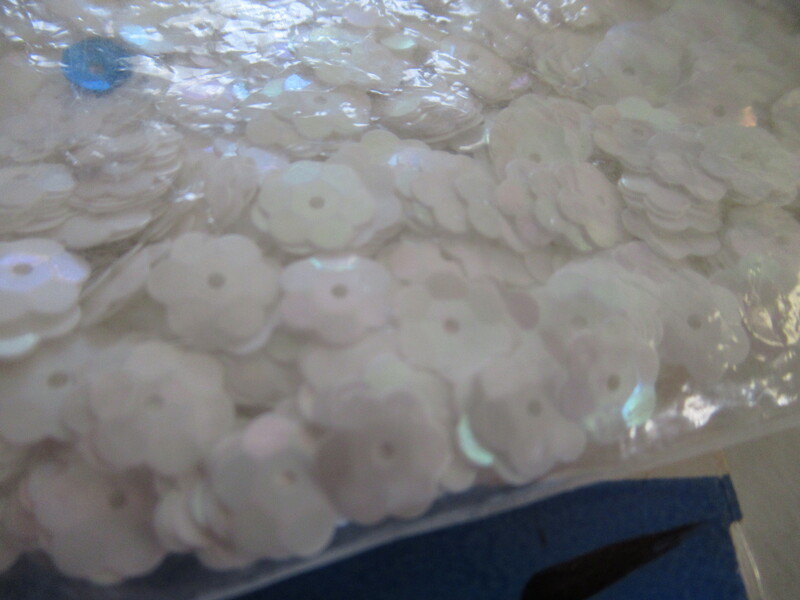 I have a good amount of sequins, many sizes and shapes, but this is far from everything out there. 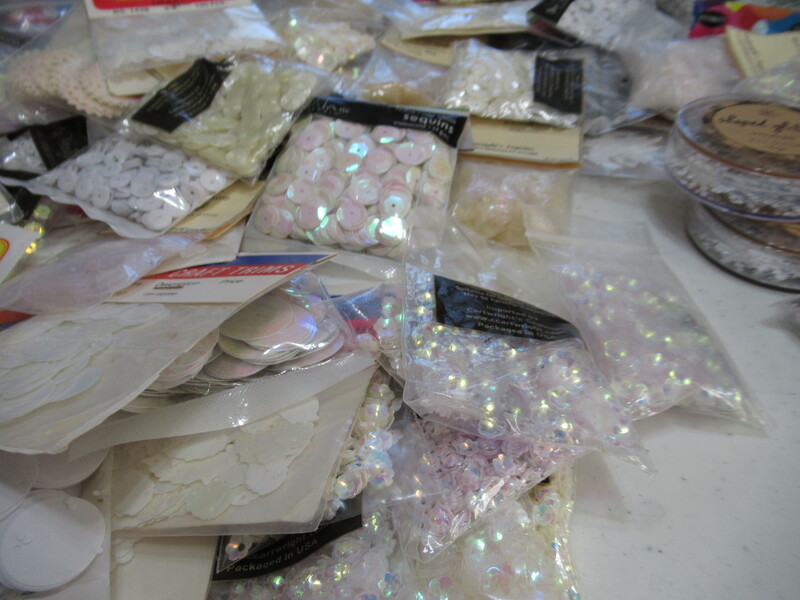 There are so many shapes and sizes of sequins I am probably only scratching the surface. 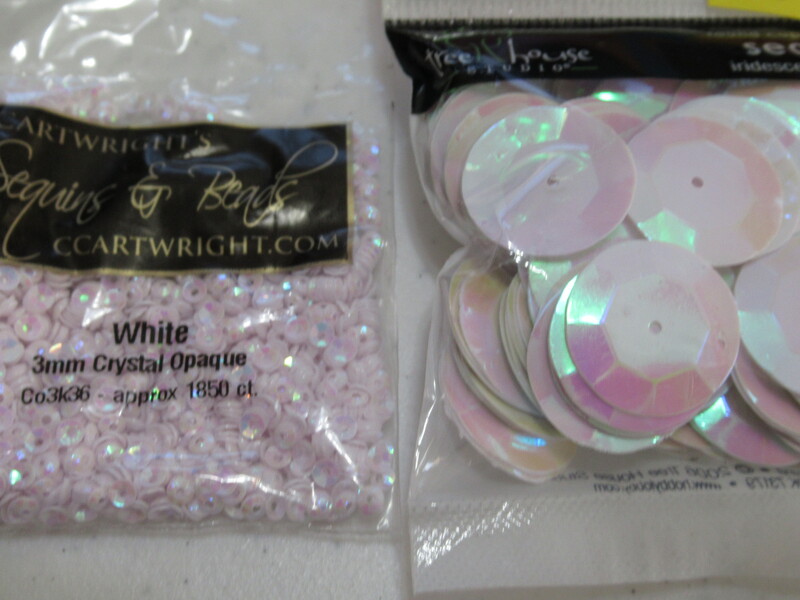 I buy most of my sequins from an online store I found over ten years ago. 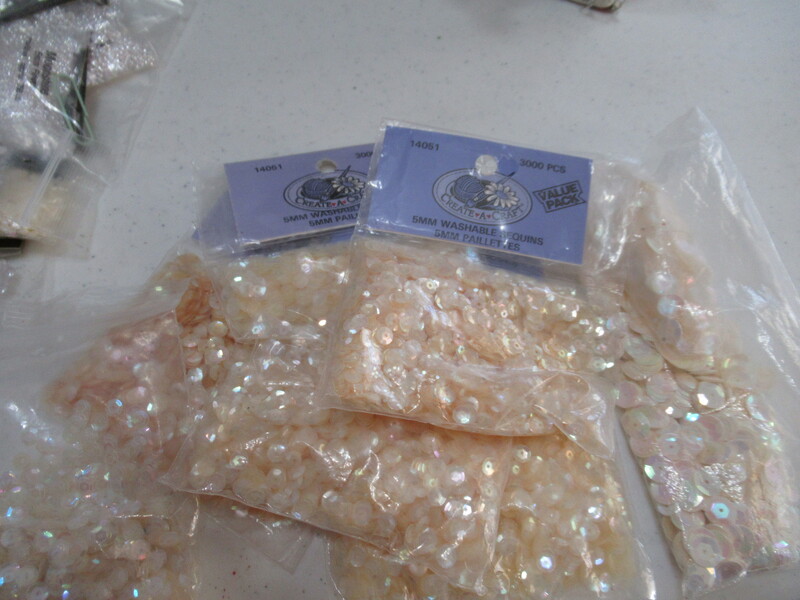 When I first started buying from them the sequins were hand packed and had stapled on labels. 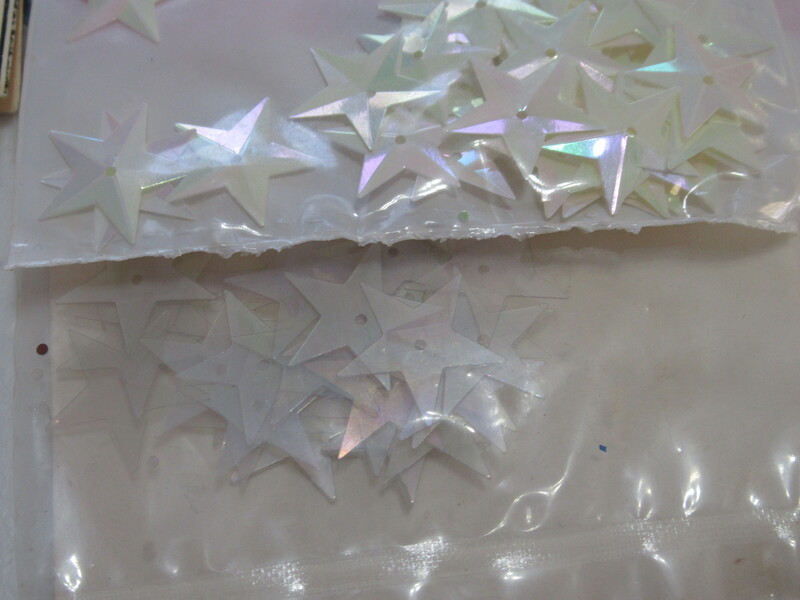 Now , all these years later, they have so many more to choose from and they are professionally packaged in little sealed bags. I get no kick back from them. Other than being a customer, they do not know I exist. However, I love to tell people where they can get great things, and if you , like me, adore sequins, this is the store for you. I keep cards from the companies that send them and over the years their card has changed a lot. Here are a few of the ones I kept. 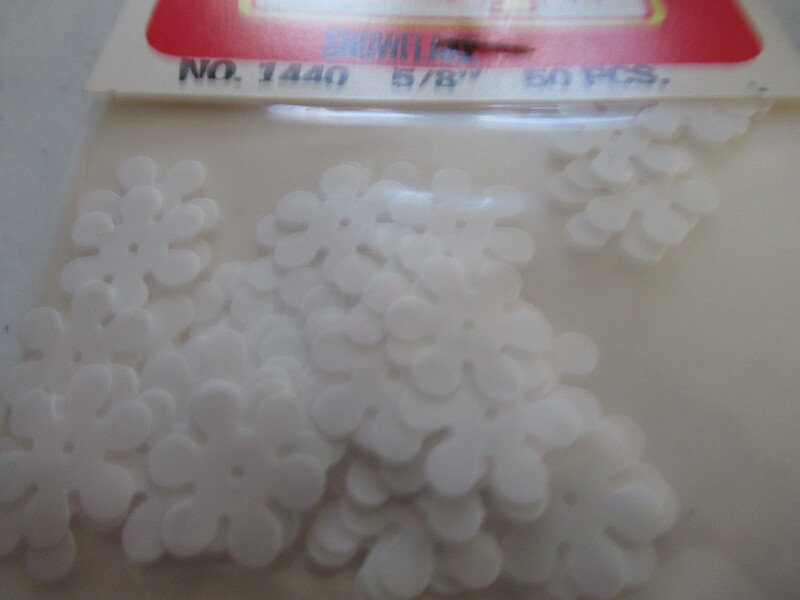 I just put in a small order, for me, just under 20 bucks, I have spent over 100 more than once over the years, but my average order is around 20 to 40, especially when they have a good clearance sale. I wish I had signed up as a member from day one, I really did not pay attention, and only the last couple years , some of my orders are on there. It would have been nice to have them all lined up, but I still have a few years of my receipts, so I could dig them up. 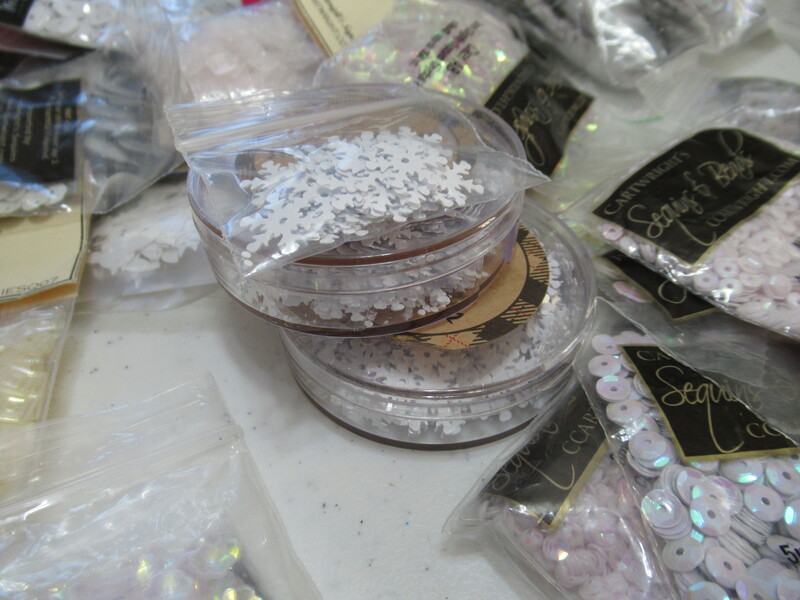 I have spent a lot there, but sequins are something I just love and plan to get back to creating with them again. So, when you type in the name, there are two c’s at the start of their name. 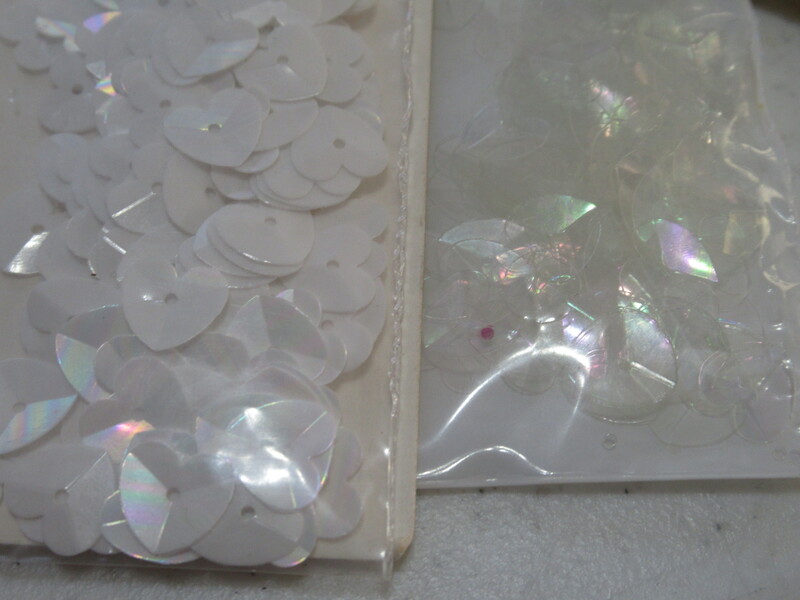 I hope you will check them out, prices are great, they will let you send some old sequins in and see if they can match them of you have a repair project, they ship fast and I believe the prices are excellent, and the shipping price is fair. 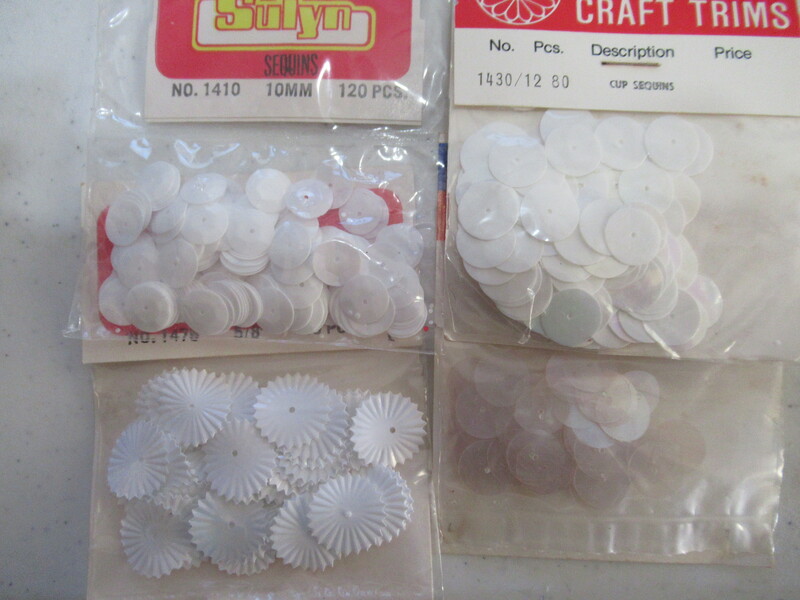 They do sell some other things as well, seed beads, which I have bought from them, some glitter, and I think they still sell buttons, but I am not sure. They also cater to people into pocket letters, and I know a lot of you tube folks who do pocket letters show Cartwright hauls. If you go to youtube and put in Cartwrights you will probably find a lot of haul videos which are fun and show you a lot of their pretty things !!! In case you want a link to click, here it is, and I really do not get anything from them, I am just a customer as far as they are concerned. They also have a facebook and youtube channel with some info on them. So, lets get started. 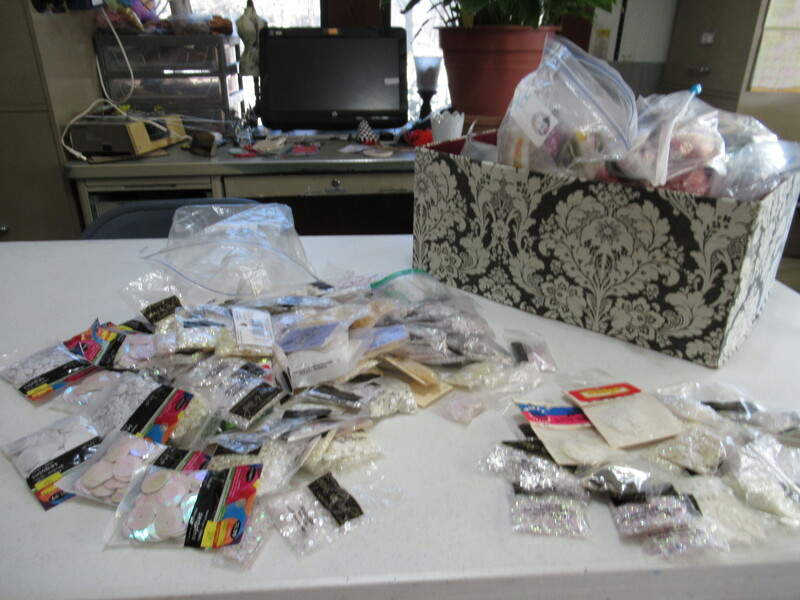 Some of my sequins were purchases from Hobby Lobby, some are from a vintage haul of over 2000 bags I got a couple of years ago ,but most, I will admit, and you can see, are from Cartwrights. I showed many from the back, so you can see the contents better, but when needing to show the size, I tried to show good pictures of the front. These are all shades of white and clear. 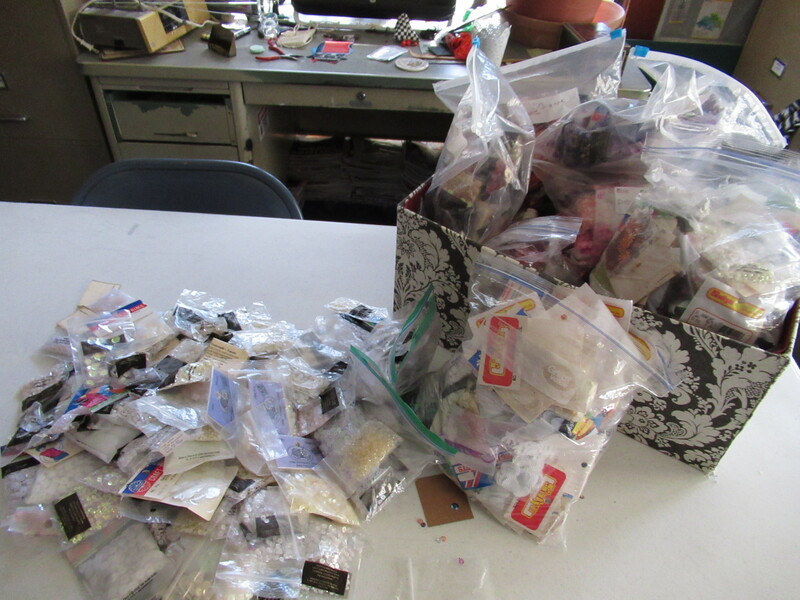 Just a small amount of all my personal collection, let alone what I have collected to sell. 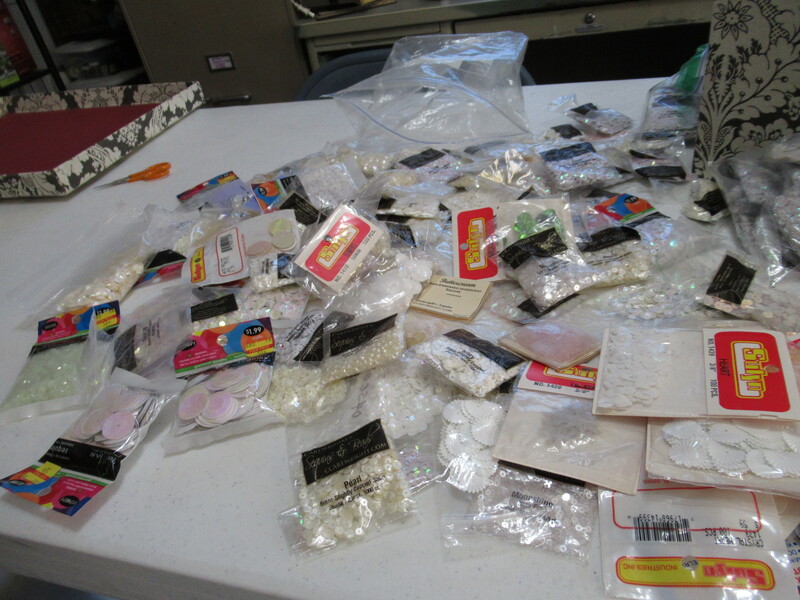 Take a breath, it is a lot, one of my bigger bags , a lot of white and clear choices, which is fascinating to me. White is white, right ? Nope. that box behind them, is filled with gallon bags of the other colors. I cannot put the lid on. lets start with sizes. 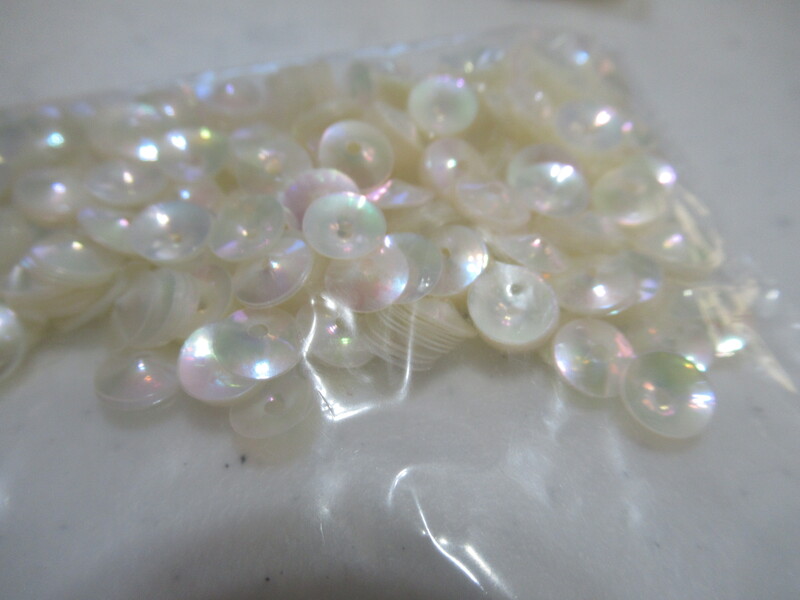 I have whites in 3,4,5,6,8,10,12,20,and 24 mm. 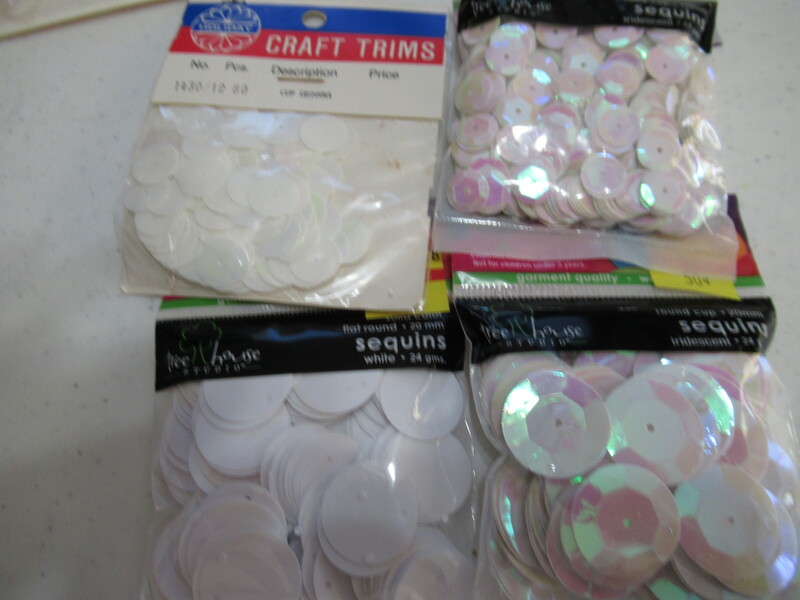 There are other sizes , in fact, I just found my biggest semi cupped sequins this past few weeks at Hobby Lobby . 12 mm was the biggest I had ever seen. 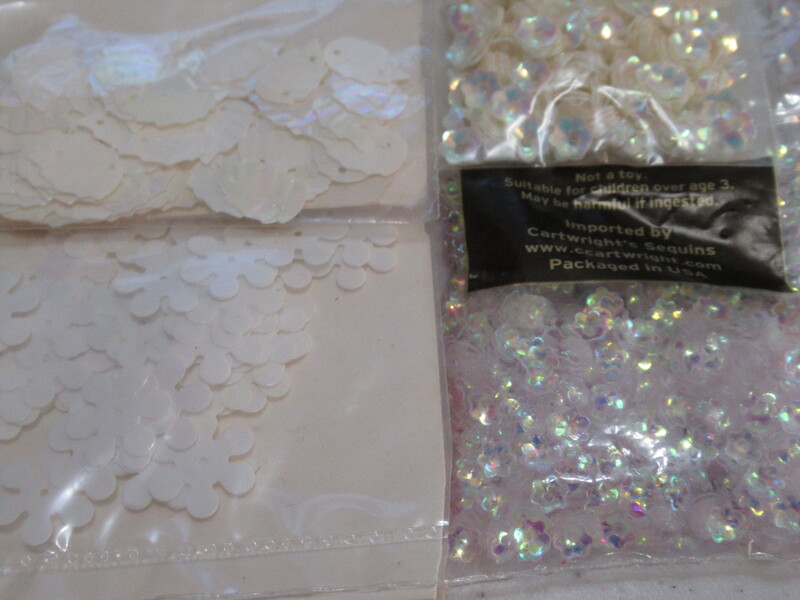 But I got some that were 24, absolutely huge and I could not be more excited to layer then with other sequins. 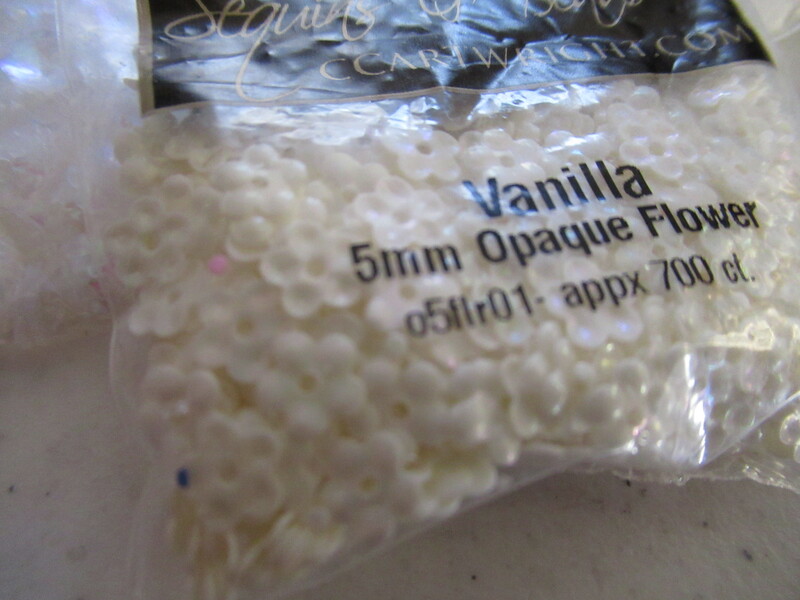 the two sizes I use the most are 5mm and 6 mm. I love the weight and look of the size 6 much more than the five. 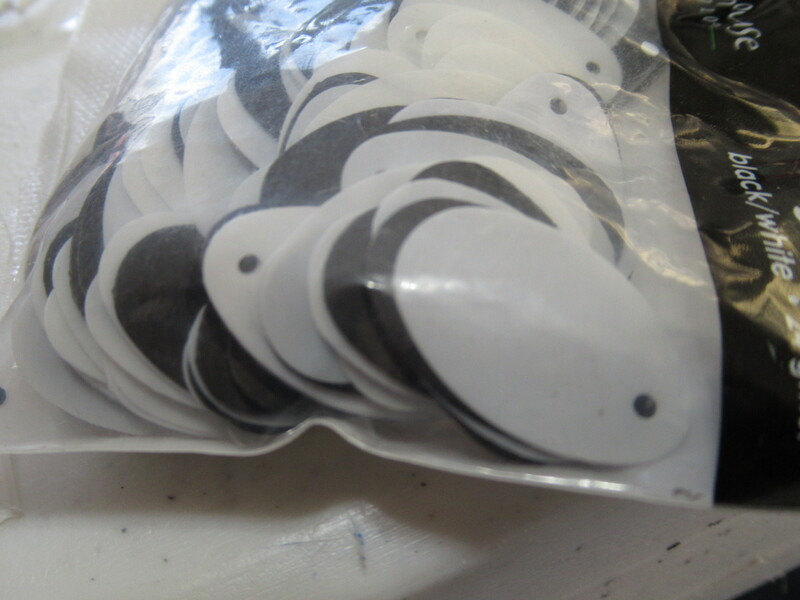 But the five is a smaller size and sometimes more convenient to use on smaller items. 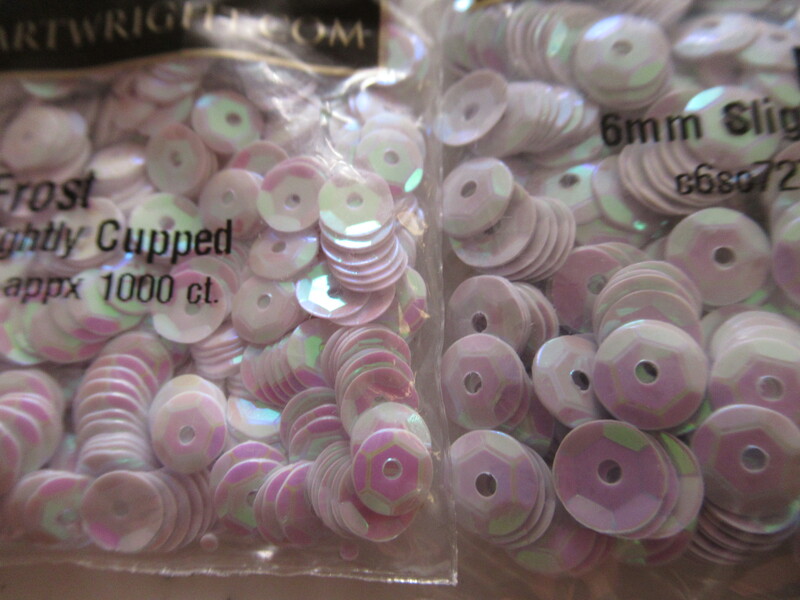 This is the same exact sequin in the two sizes. 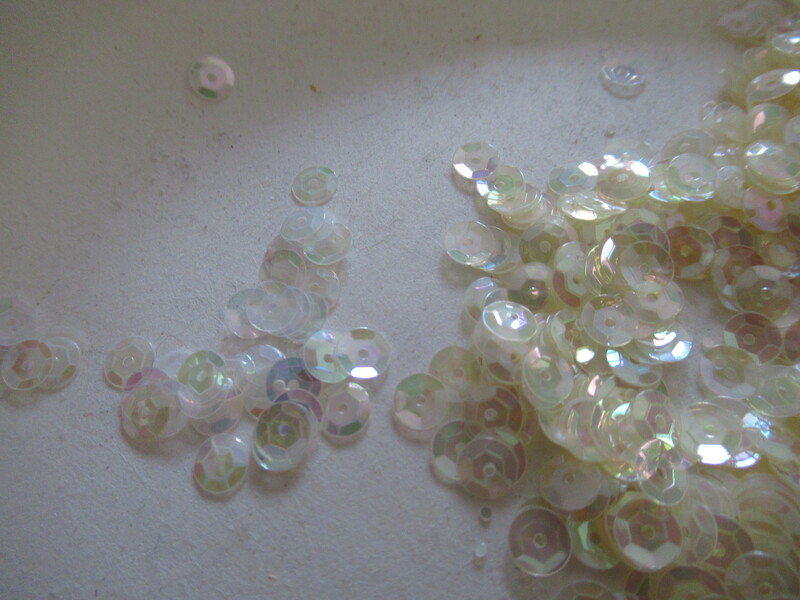 You can see just changing the size makes it look like a slightly different sequin. 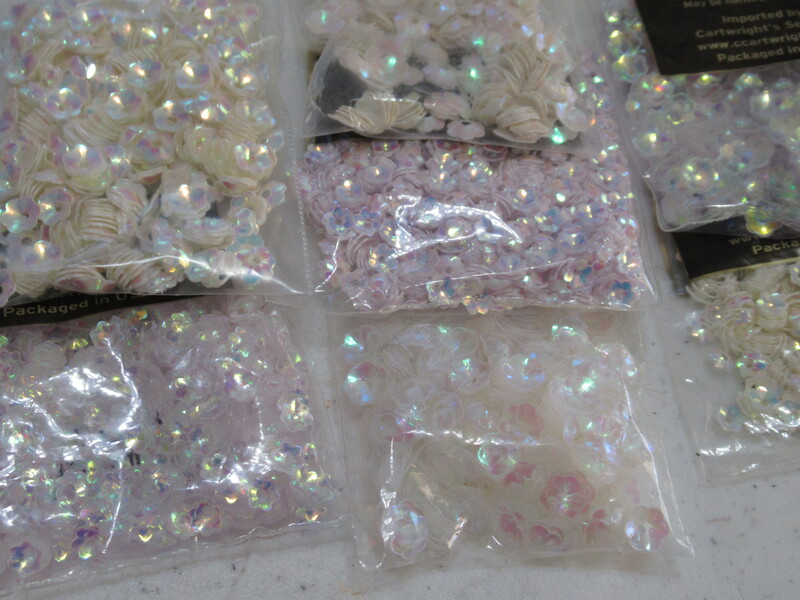 Frost is the color of both but the small look brighter and have a more pink glow, where the larger have a darker look. Could be lot changes too, not sure how that works with sequins, but found that interesting. 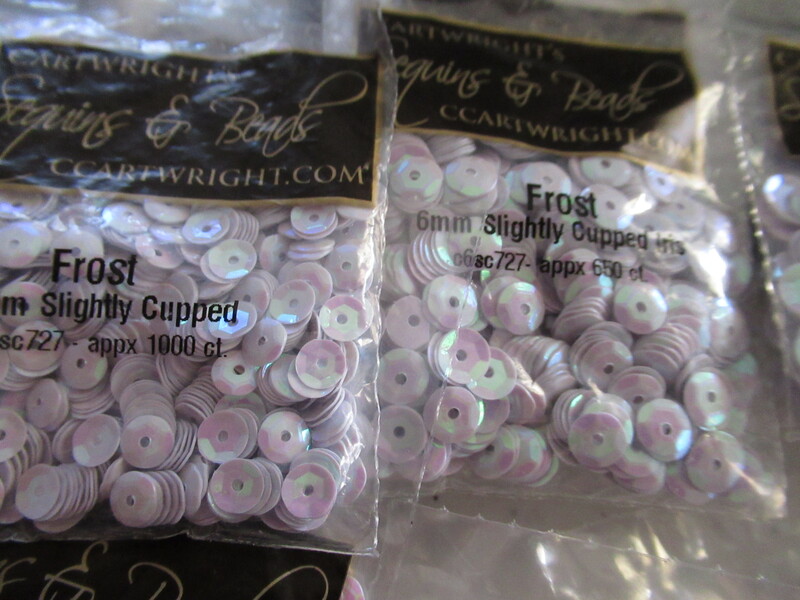 I have a ton of frost, but that is beause a few years ago, Cartwright had an insane sale where they had certain colors at 25 cents a bag, and the few colors they had, I bought a lot of them. 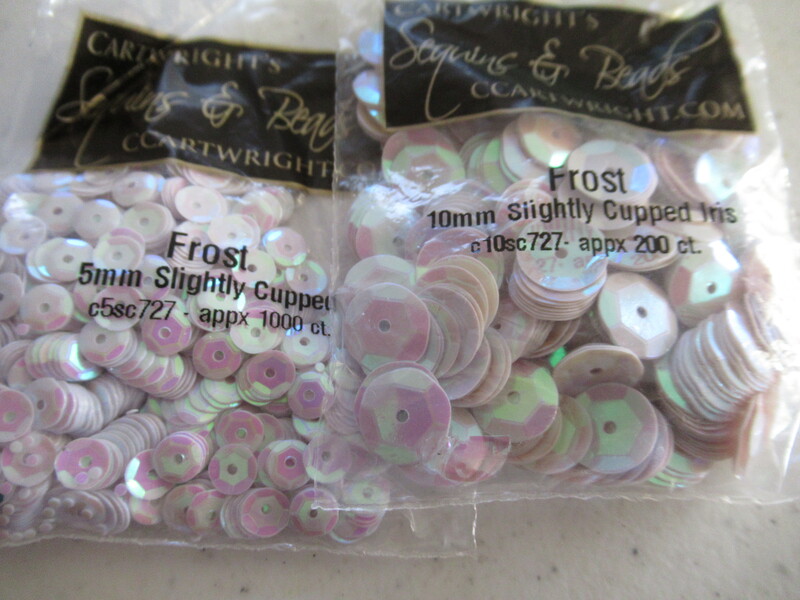 So, I have quite a few of the frost in both the cupped and flat in several sizes, but mostly 5 because they are best for some ornament kits I plan to sell in my Etsy shop this year. 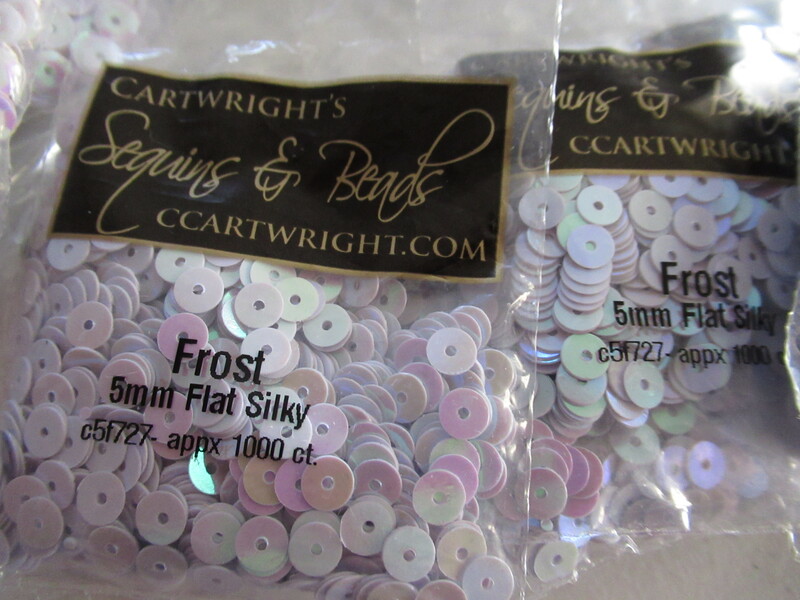 funny thing is, I have several sequins from other places, and one other Cartwright one, that is very similar to the frost. one being cool white, but it does not have the reflective finish. It is very small differences that make up the different shades I have found. 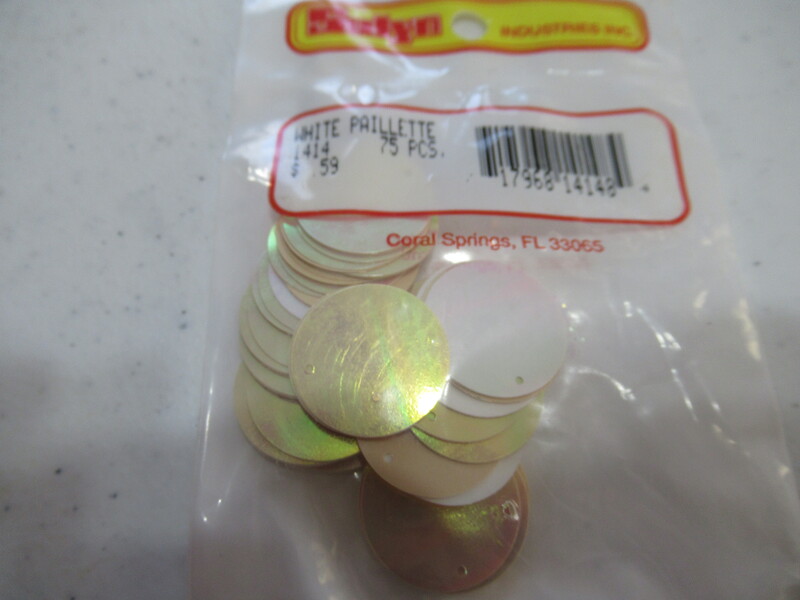 Here are some of the colors of white I have. 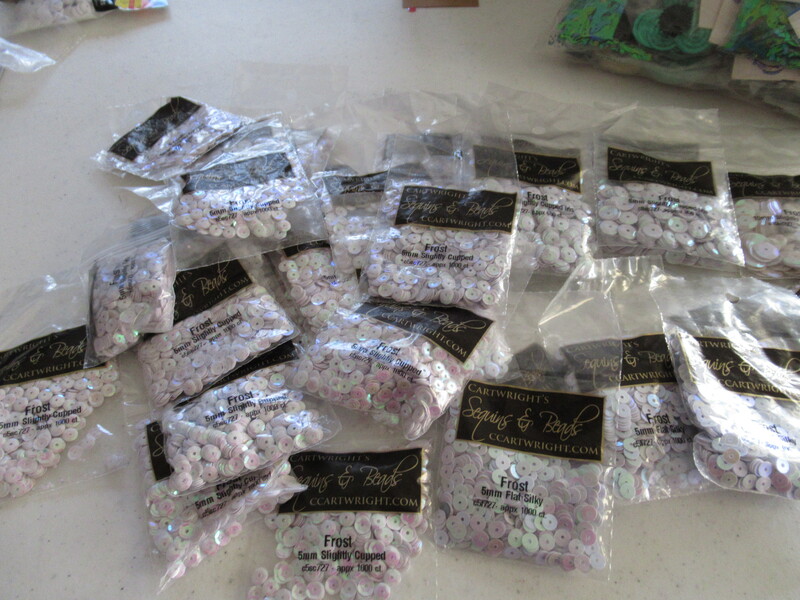 Kind of makes me laugh that there are more than one white, but I know paint colors are the same, as are beads. Why have one white when you can have 20, and I have all the ones from Cartwrights , as far as I know, there could be a new one I missed, but I feel this is pretty accurate. There are so many finishes and coatings, and colors. 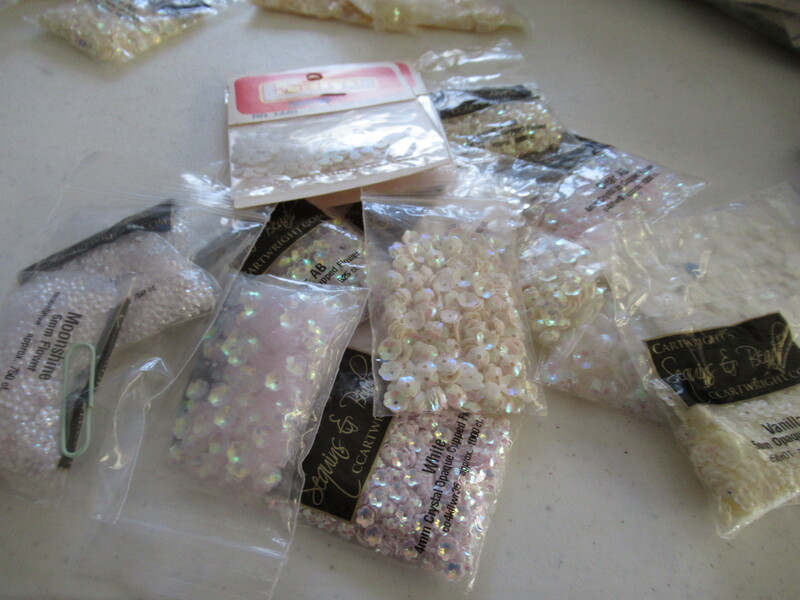 Moonshine, cream puff, satin, pearl, crystal clear,clear AB, which I will get into in another post on sequins in more detail . 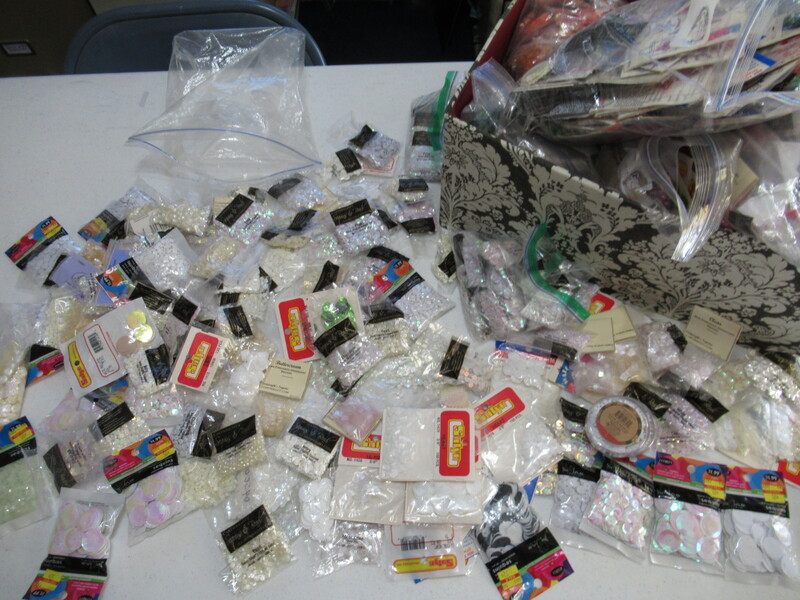 When I first started working with sequins over 25 years ago, there were not many to choose from. Mostly metallics, gold, silver, blue, red, green, sometimes a yellow green, rarely brown and orange, at least where I lived. But I found these. Back then they were much clearer, after 25 years they have yellowed a lot. 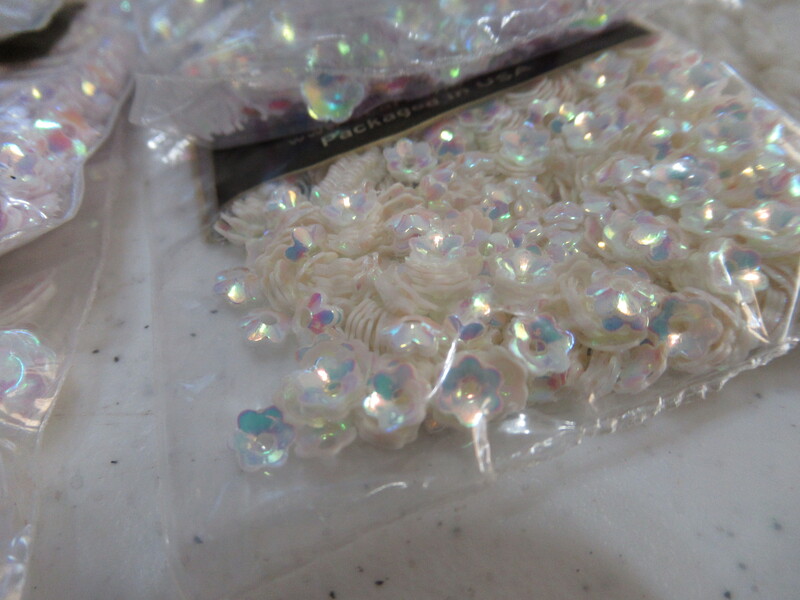 But I could put these over a bright colored felt, and the color would come through very pretty, and I would use a clear seed bead to hold on the sequin. I still have all of these, and individually, they are not as yellow as they are in the package. Even the different packages are different in the amount of yellowing they have and the bag of loose ones I rebagged years ago, has much less . I am wondering if the bags could be part of the yellowing. The ones I bagged have yellowed way less. 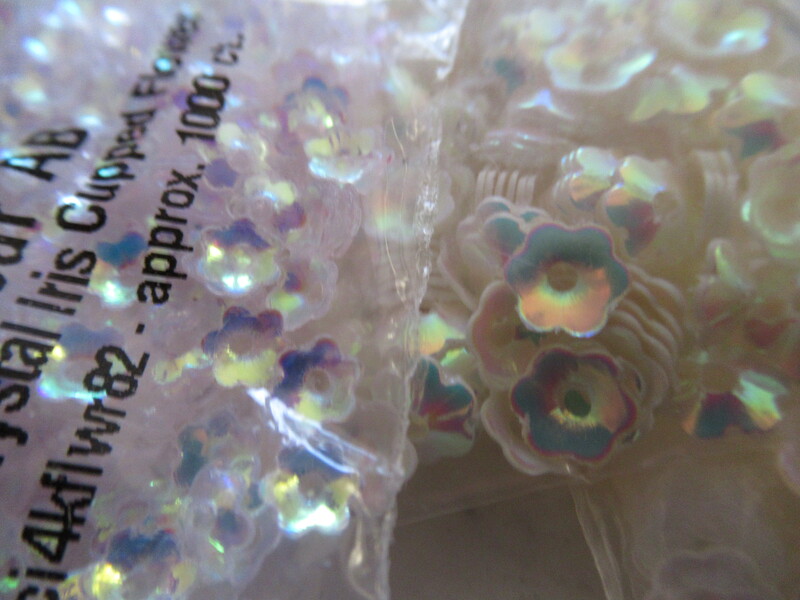 They are by far the most reflective and beautiful of all my sequins, and I think the aging adds to it. I love all my whites and clears, but these still hold a special place in my heart !! You can see, even with the aging, they are very reflective, the pictures do not capture it hardly at all. In person they are stunning !! 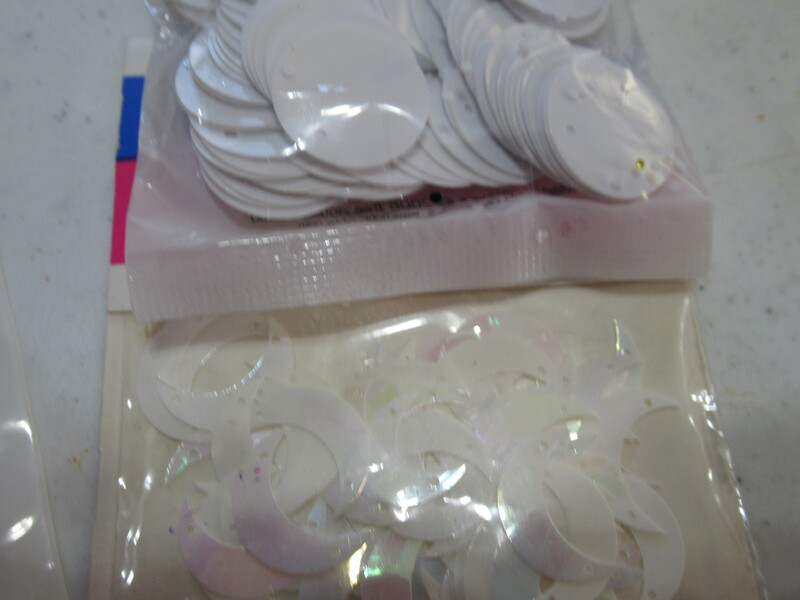 Lets look at some of the interesting shapes I have in clear and white. I am not sure where I got these but they are one of my unusual ones, they are completely rounded, like a ball cut in half with the hole in the middle, and very reflective. No packaging , so probably off of Ebay or Etsy . 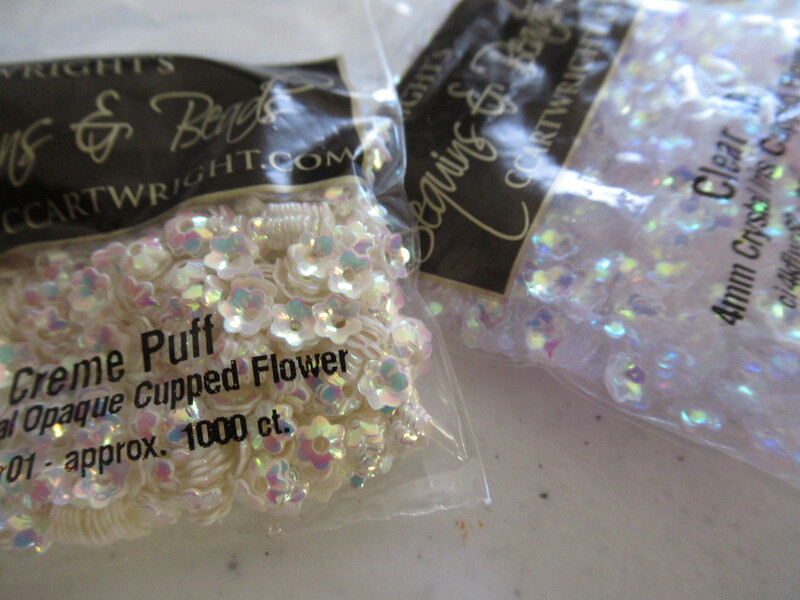 Lots of pretty flowers from Cartwrights, I have these in colors as well and love them !! 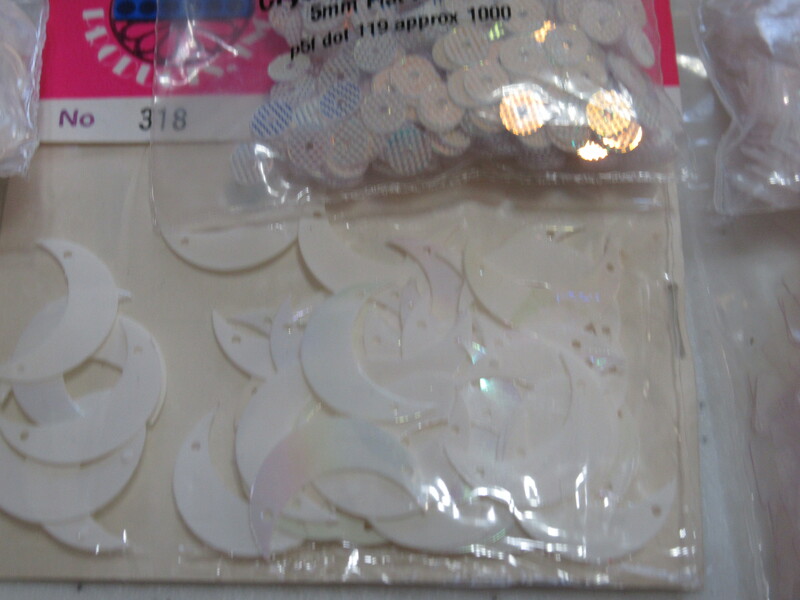 I love the vintage daisy sequins at the bottom, only got one or two white, so I kept those for myself. I have them in other colors that I sell in my Etsy shop. 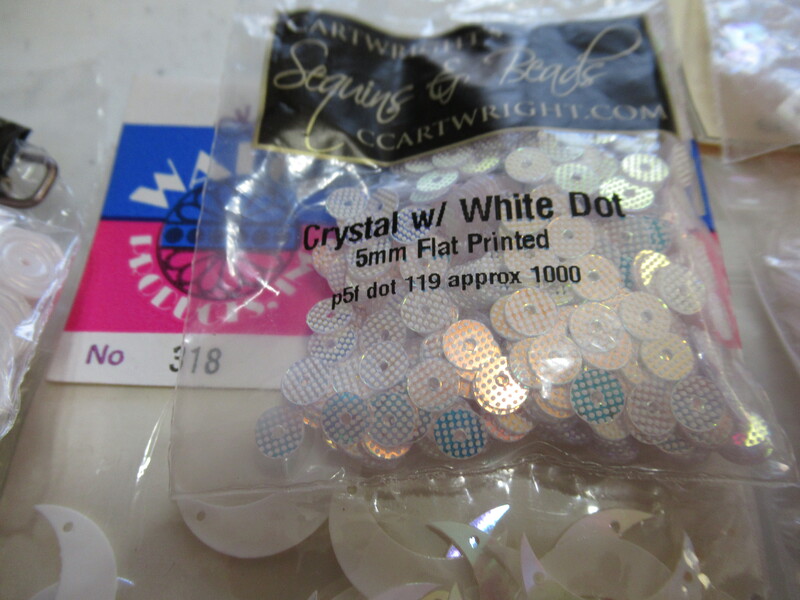 These are my vintage sequins, I love the star bursts, when I bought my 2000 bag haul I only got two white, out of orange and green and other colors, but kept those two white for myself as I loved them so much. 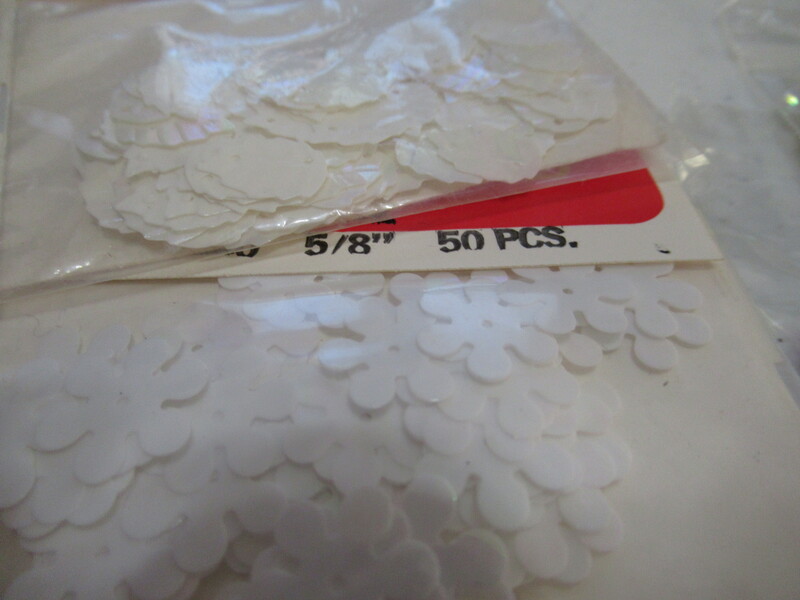 I have some flats in clear and white and then some of the normal semi cupped. 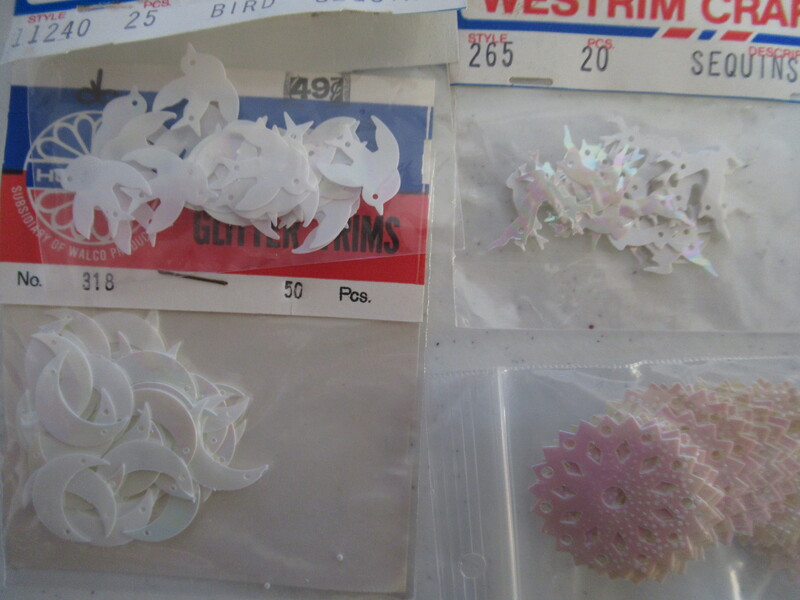 white doves, reindeer, crescents , all vintage, but the fancy AB filigrees are not vintage, but not sure where I got those . 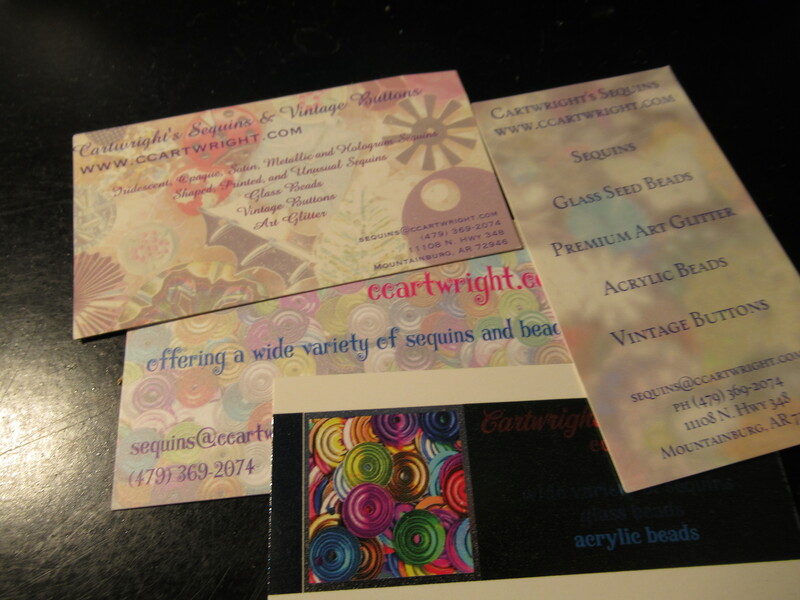 I do buy some loose vintage and regular sequins from Etsy and Ebay, and not sure if that is where those came from. It is still possible they came from Cartwrights. 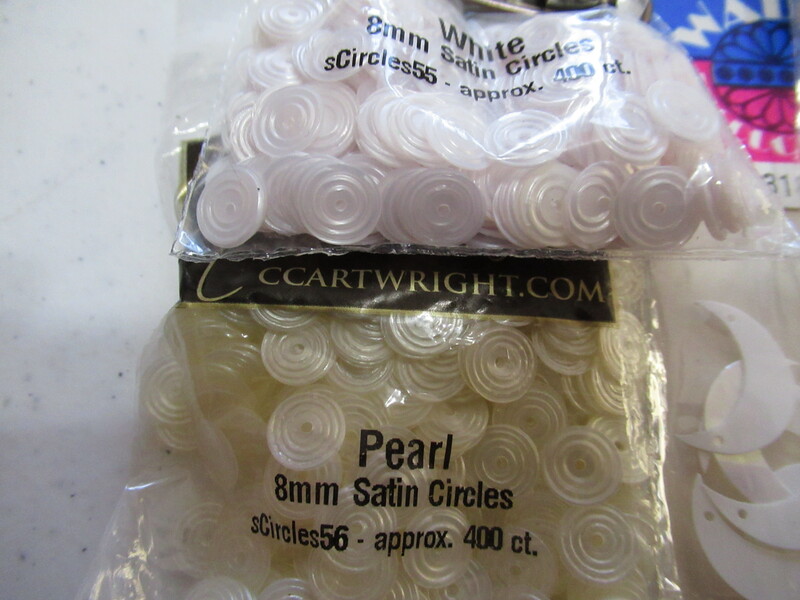 Fun circles in white and pearl, both are 8 mm , both are satin finish, which is just like it says, a pearl like finish, no sparkle, but has some shine. 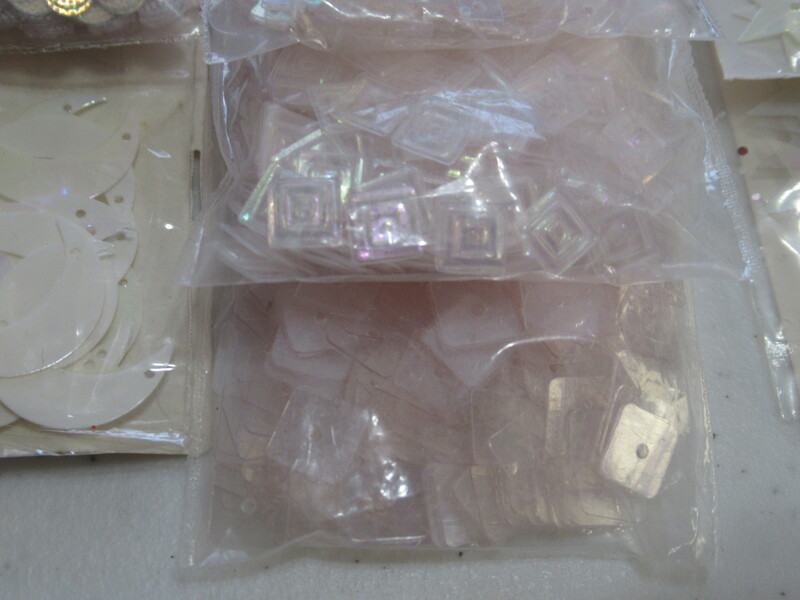 The squares come in different sizes, and both flat and with this pretty pattern on them. 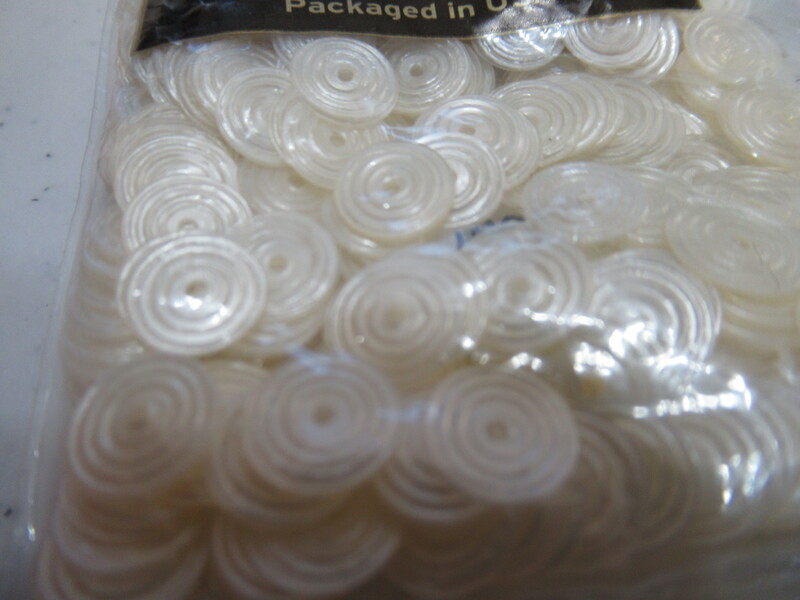 I have them in several colors and just ordered some of the patterned ones in a peacock blue, which should be stunning. larger flat flowers from either Hobby Lobby or Michaels a few years go. 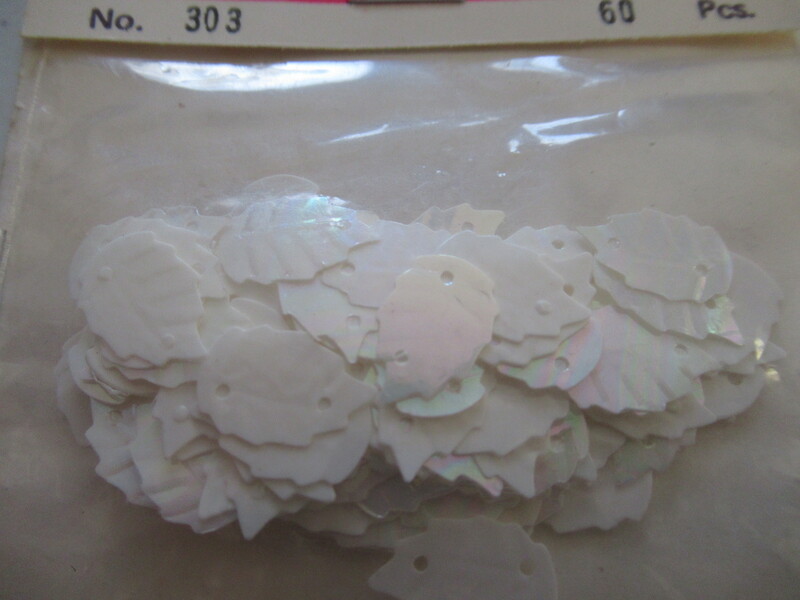 the bigger flat ones below are vintage and one of the two whites that I got, and kept both. 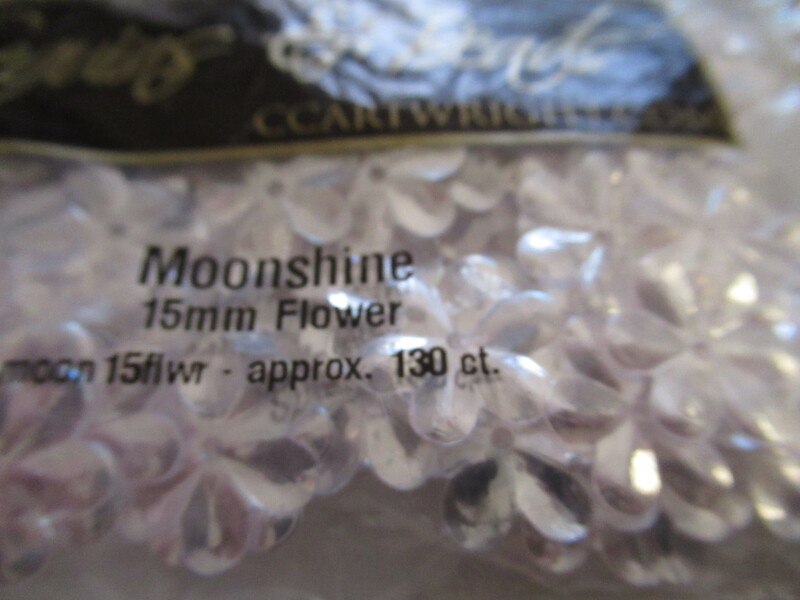 These bigger ones look like rhinestones in the bag, but the moon shine finish is one of my favorite finishes at Cartwrights . Very reflective and just gorgeous !!! 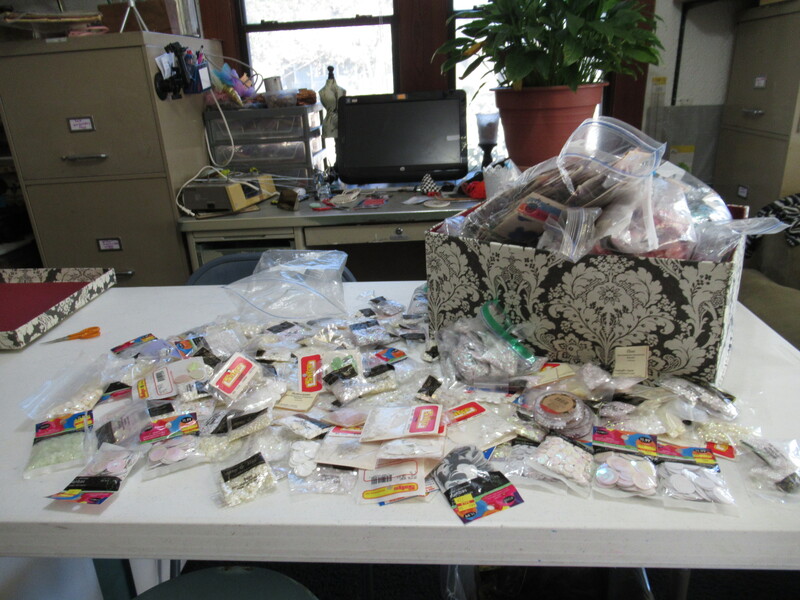 I have all the sizes and many of the shapes you can get it in. I love this flower. It is a bigger one, 15 mm. A small tease, here are all my personal ones except for a shoe box with my really special vintage ones in it. 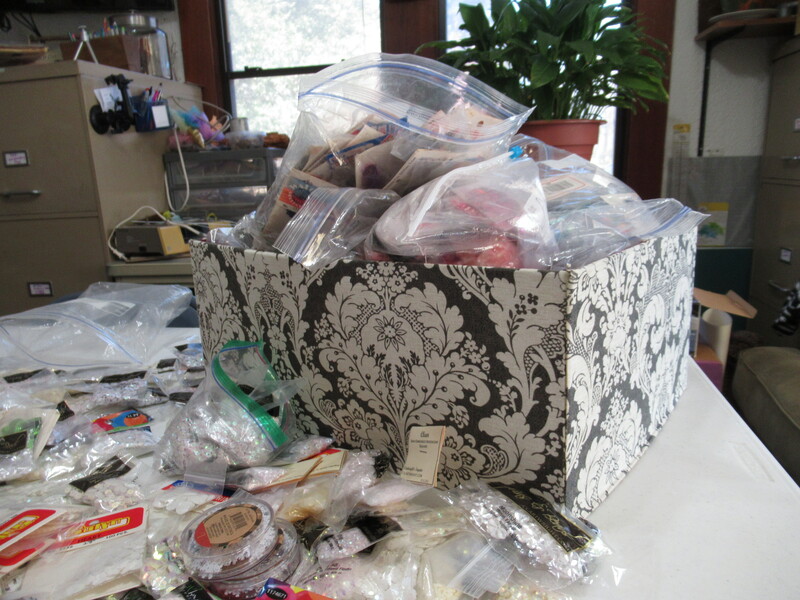 NOT a full shoe box, it is just a few special items along with other fun sequin objects. Here is my blue bag, and there are also blues in the shapes and flowers I am sure. That will be the next post in this series. 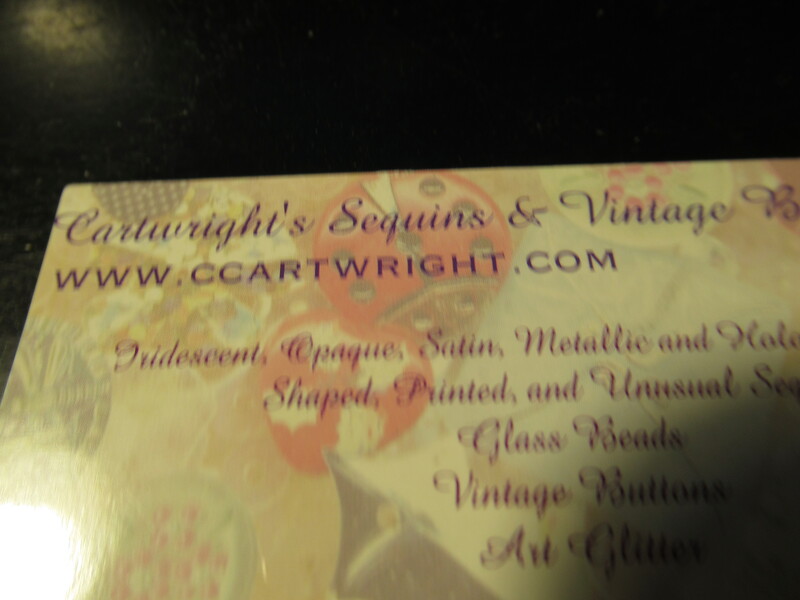 In case you want a link to Cartwrights, here is their address, I do not gain anything from you clicking, but maybe if enough clicks come from here, they will notice me , ha !! I do not get paid by them, I am just a huge fan of their online store. 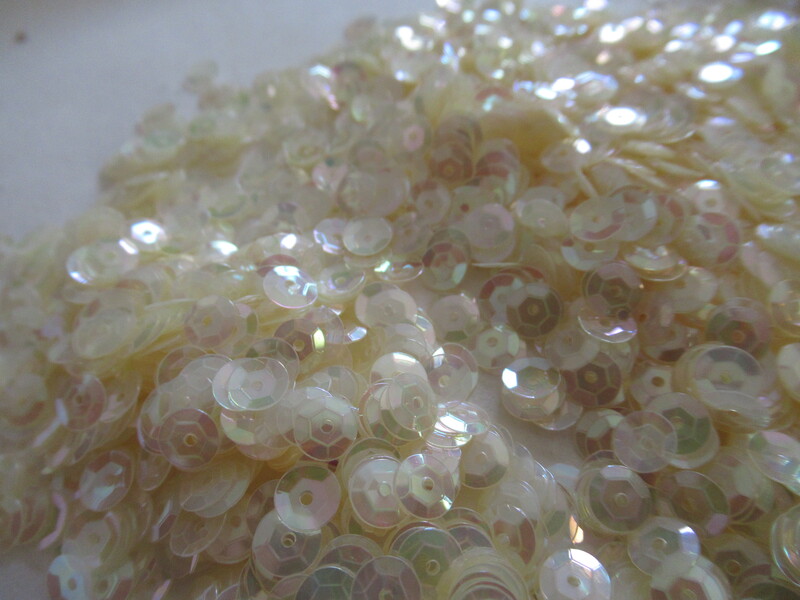 High quality , vast selection of sequins in any color you could possibly want. Once again, if you need a link, here it is. I really do think they are the best around, price ,quality and selection and I am a huge fan of their products !!! 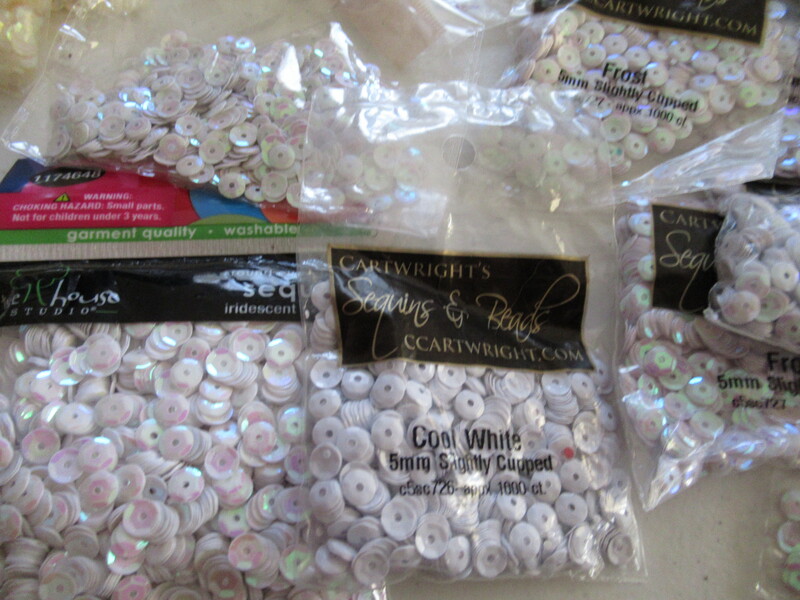 Love to help a fellow sequin lover out with a great source !!! not sure if this link will work, if it does not, I will see if I can add it on the side bar, I know it is just easier to click on a link, but they are pretty easy to find. 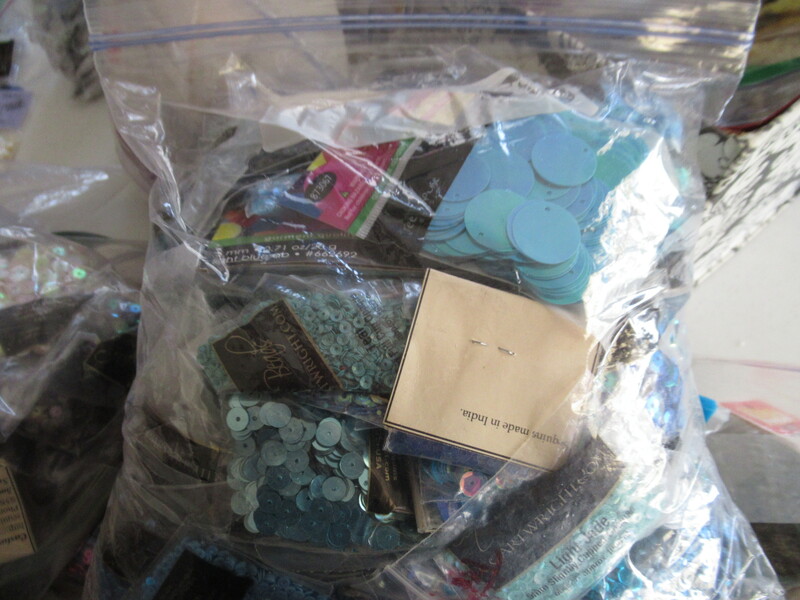 I hope you enjoyed this post, I will be doing one on each bag of color I have, so there are a lot of posts to follow, blue, purple, green, yellow, orange, red, brown, black, gray, some have more colors then others. Blue will be the next, it is the one with the most after the white. So many pretty colors !! 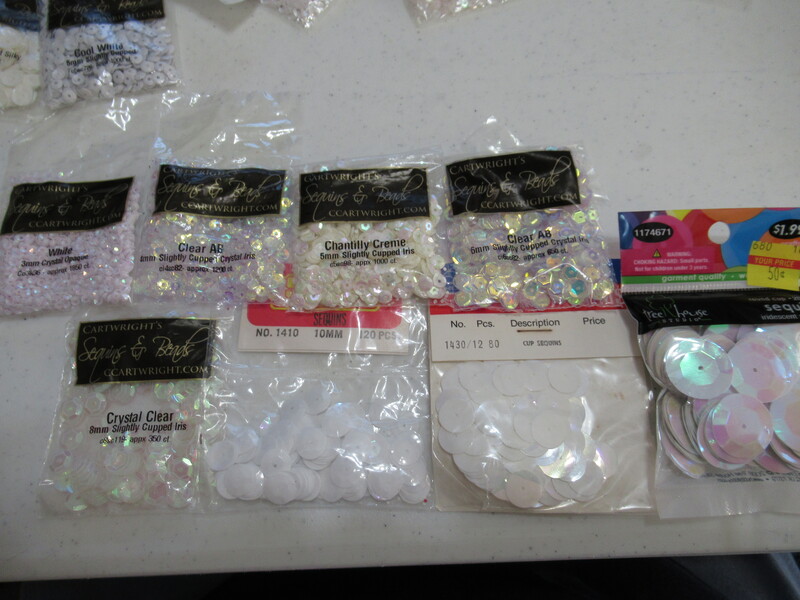 I will also do a post that talks more about sizes, shapes, kinds of sequins and the finishes. 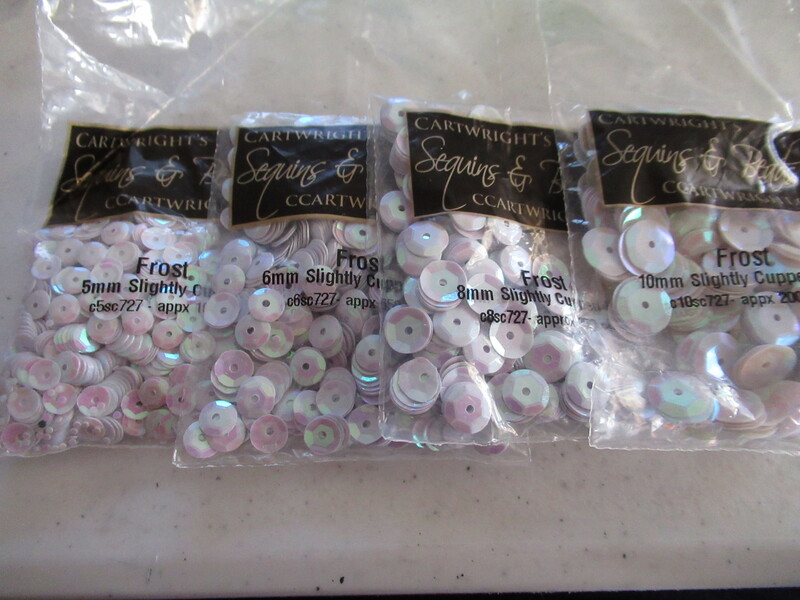 thanks so much, hope you got something out of this post, and if you have any interesting sequin information or sources, I would LOVE to hear about them !! my etsy shop , please check it out, adding more every week !! 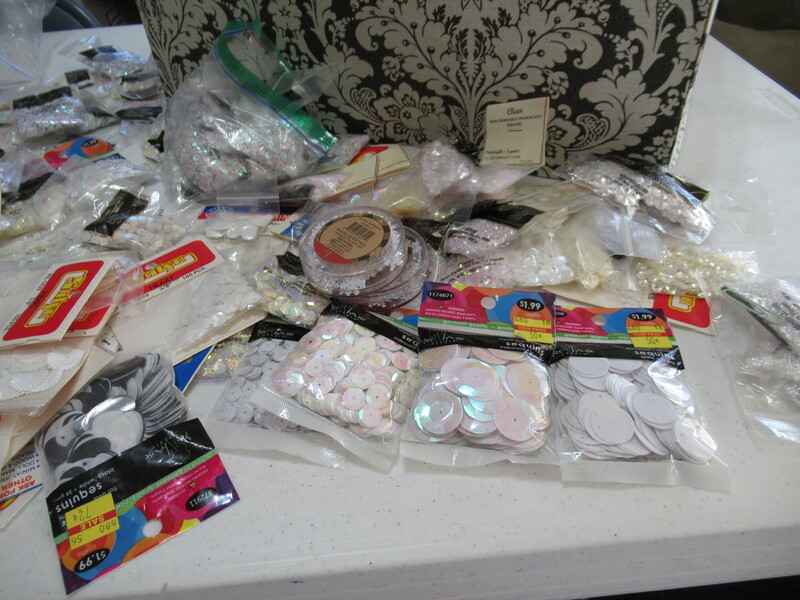 ← Hobby lobby haul, thrift store haul , yard sale haul, so many treasures !! !